Dr. David Bullock and graduate student Jaeseok Hwang went to New York to meet with Margaret Krause and Dr. Michael Goore of Cornell University and the Advanced Ag Alliance, a non-profit organization in New York dedicated to running on-farm whole-field agronomic trials with participating farmers. DIFM and the Ag Alliance agreed that DIFM would analyze and report on data from their experiments between 2015-2018, and will design approximately 20 trials for the Advanced Ag Alliance in 2019. These trials will focus on seed rate and seed variety. In return, they will provide funding for a grad student research assistant’s tuition and salary. 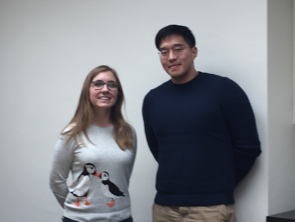 Jaeseok Hwang and Margaret Krause, meeting at Cornell University, to discuss Advanced Ag Alliance trials. 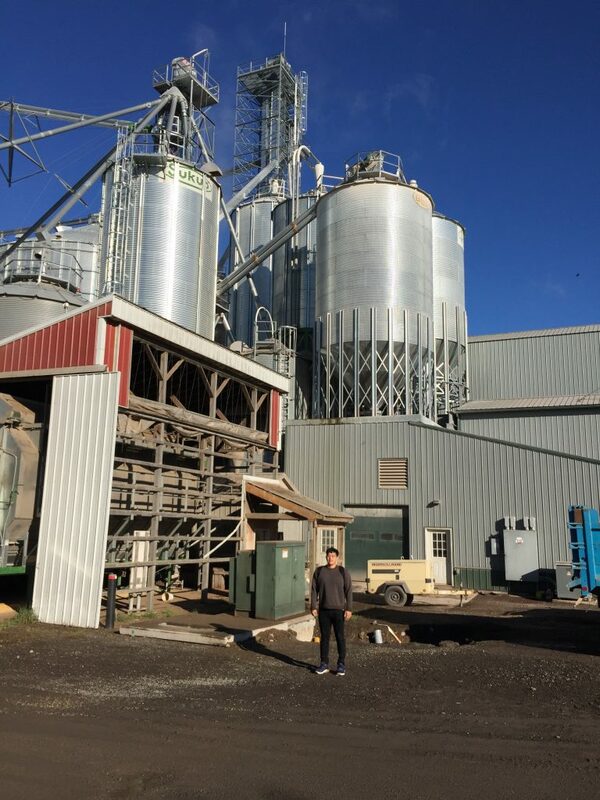 Following this, Bullock and Hwang went to Auburn, New York, to meet with farmer Todd DuMond. DuMond was the principal driver behind the Ag Alliance’s on-farm research project. DuMond has a BS and MS in Engineering from MIT, and is passionate about Data-Intensive Farm Management. They discussed field trial details. DIFM grad student Jaeseok Hwang will conduct the statistical and economic analyses for the DIFM/Advanced Ag Alliance field trials in New York state. Here, Jae is shown at the farm of farmer Todd DuMond, who founded the AAA. DIFM graduate researcher Paula Girón was named one of the International Plant Nutrition Institute’s (IPNI) 31 Scholar Award recipients. The IPNI awards graduate students in countries with an IPNI program in science programs relevant to plant nutrition science and the management of crop nutrients. Paula Girón is working toward her M.Sc. in soil since at the University of Buenos Aires in Argentina. She is working on a thesis focusing on site-specific nitrogen management in maize in the northwestern Buenos Aires province. Girón was a visiting scholar with the DIFM project during fall semester of 2016. Professors David Bullock, Maria Boerngen, and Divina Gracia P. Rodriguez just received a first look at their accepted paper in the Agronomy Journal, titled “The Origins, Implications, and Consequences of Yield-Based Nitrogen Fertilizer Management.” Take a look! During a trip to Colombia by Brendan Kuhns, it became clear that yield monitors for cotton are hard to come by, especially the kind that is retrofittable on older machines. Fortunately, DIFM researcher Dr. Tony Grift did his PhD on the development of a generic method for mass flow sensing of granular materials (fertilizers in particular), and he is eager to apply his method to cotton. We will build a new optical photo-interruption arrangement that measures the spacing durations between clumps of cotton passing a sensor. Then we will apply the theory of arrival processes to determine the number of cotton clumps that pass the sensor per unit of time, which is an indirect measure of the mass flow. What is so fascinating about this method is that it works by only measuring the spacing times in between cotton clumps. So without knowing or measuring any material parameters, we still can measure the mass flow. It gets better: the measurement device does not need calibration, since nature is literally doing the work. If you would like to read details, here are links to paper 1 and paper 2 (the second won an award from the EurAgEng organization). Figure 1 Shown is the mass flow sensing scenario; we have clumps of material (cotton balls) and we measure the spacing durations among them. Believe it or not, using Poisson driven arrival theory, these data are sufficient to determine how many clumps are passing the sensor per unit of time, irrespective or the overlapping effect. Isn’t statistics great? We propose to create an integrated FEW model and with user-friendly software to 1) enable individual farmers to examine the predicted economic and environmental impacts of their fertilizer management strategies, and 2) provide policy makers with a user-friendly tool in order to design policies that will lead to efficient reduction of N-nitrate contamination in the Mississippi River Basin. The model will be based on the ideal CyberGIS computation platform, and expand to the scale of the Mississippi River Basin the DSSAT crop growth model and the SWAT water drainage model. The model will also integrate the BioScope model of biomass supply, and a partial equilibrium economic model of crop, energy, and biomass markets in the U.S. Midwest and beyond. We argue that the principal shortcoming of current agricultural “Big Data” is that there is little record of variance in managed input use. Of course, managing inputs efficiently is the whole point of farm management, whether the goal is to increase monetary returns or environmental sustainability. Therefore, we propose to parameterize our integrated model with data we generate from large-scale, on-farm agronomic field trials over an entire small watershed. Those trials will randomize N application rates and cover-crop management strategies to measure both yield and water quality results of varying these managed input variables. We will use the generated data with existing agricultural “Big Data” to create “decision tool” software to improve private and public crop fertilization strategies. The proposed research will rely heavily on the proven abilities and infrastructure of the CyberGIS Center for Advanced Digital and Spatial Studies, and on the software, administrative capacity, and scientist-farmer relationships developed in an on-going USDA-NIFA Food Security project on data-intensive fertilizer management. In addition, we will provide opportunities for underrepresented undergraduates to gain research experience through an extension of the WE CAN program. Professor and PI David Bullock has submitted and co-submitted a pair of abstracts for the ISPA Conference in 2019. With P. Paccioretti, M. Cordoba, C. Bruno, and Monica Balzarini, Professor Bullock submitted “Statistical modeling for on-farm experimentation with precision agricultural technology.” Professor Bullock submitted an additional abstract regarding the value of on-farm experimentation. Joshua Babes is an undergraduate at UIUC studying Agricultural and Consumer Economics who is volunteering to work with the Data-Intensive Farm Management project. Joshua comes from the north side of Chicago and is working towards a career in consulting doing data analytics. He hopes to begin to learn more about the analytics while contributing to DIFM. DIFM Research Featured in CSA News Magazine! Development of a new method for cotton yield monitoring: Think big or go home!